300mm f/2.8 lens & hood. 400mm f/2.8 lens & hood. Sigma 150-600mm lens & hood. Other lenses (plus hoods) - up to 20" (50cm) long. Easy to use with shorter lenses. Made of Silnylon, a waterproof, ultralight, and tough high-performance fabric. 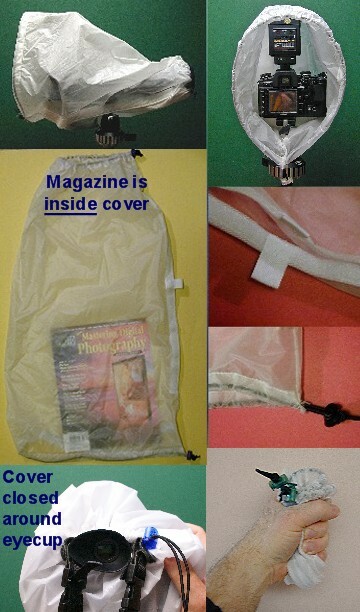 You can use this cover in "See-Thru" WHITE with lens+hood combos up to 16" (40 cm) long. UNIVERSAL CAMO (out of stock) - More info and size recommendations. The cover has an elastic cord & cordlock on both ends, and velcro on the seam that runs from the front to the back. You open the velcro & place the cover over the camera then attach the cover around the lens, and leave the back end open however much you want when you're shooting (the back opens to about a 10" diameter circle when fully open). If you use a viewfinder extender or eyecup, you can close the back of the cover around them.